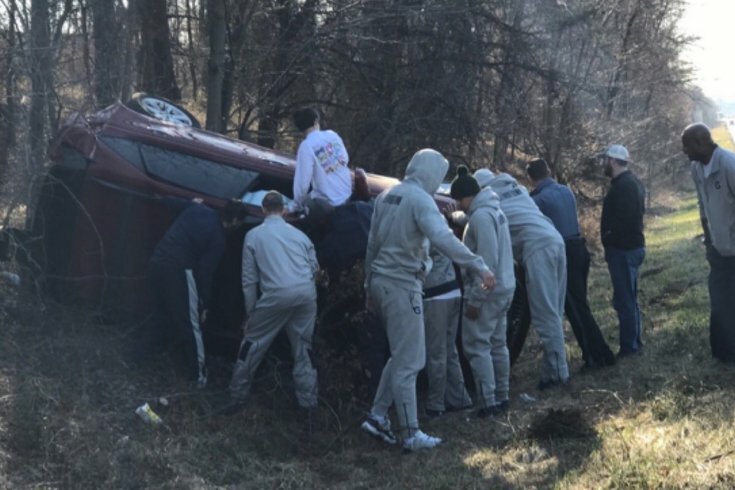 A bus transporting members of the Georgetown University men's basketball team was involved in a crash Monday while traveling for a game against Villanova University, authorities said. Maryland State Police announced two people were injured in the two-vehicle crash that occurred around 2:30 p.m. Monday on Interstate 95 near state Route 100. No one from the team reported any injuries at the scene to medical personnel. Investigators said the bus rear-ended an SUV, sending it off the right side of the highway, where it overturned. The bus stopped at the scene, and players were able to assist the occupants out of the SUV. A 49-year-old woman and a 17-year-old boy were transported to a local hospital for treatment. The school explained in a release that another bus was provided for the team, which plays at No. 2 Villanova tonight at 7:00. No charges have been filed, but a crash investigation is ongoing, police said. The game will be played as scheduled Tuesday night at the Pavilion on Villanova's campus, beginning at 7 p.m.